Councillors have given the all clear for a new Tesco supermarket to be built in Lockerbie. 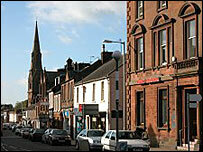 At a meeting in Annan Town Hall they decided to agree the plans for the site at Goods Station Road. Members of the regulatory committee approved the store by six votes to three despite some concerns about the impact on other shops in the town. Tesco claims the plan could deliver more than 150 jobs and help keep more people shopping in Lockerbie. Lockerbie councillor Lavinia Vaughan put forward the motion in favour of the plans. An amendment to reject the application was proposed by Moffat member Roger Grant but it was voted down as the committee approved the development.